Sony KDL-32W653A review | What Hi-Fi? 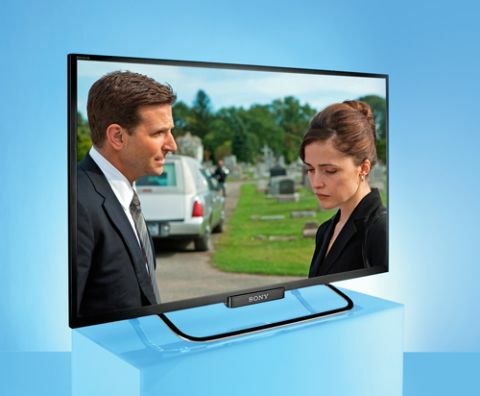 The Sony KDL-32W654A certainly creates a great first impression. The 32in Sony TV's slim frame perched on a curved stand is a lesson in minimal elegance, and that narrow bezel ensures you see the most of the 1080p-resolution screen. Turn the TV on, and the Sony KDL-32W654A looks even better with a sharp and detailed picture that holds your attention. With our eyes glued to the BBC’s live Wimbledon coverage in high-definition (thanks to the built-in Freeview HD tuner), the Sony proves to be a natural-looking screen that nicely conveys the faded and scuffed patches of the grass courts, and the crisp and stark whites of the players’ uniforms. From conveying the texture of metal, tarmac and grit on a standard-definition broadcast of Top Gear, to the vibrant explosions of colour on a Blu-ray of Dredd, the KDL-32W654A is a talented and enjoyable screen. However, it’s not quite as detailed when compared to some of the more subtle screens we've seen – the Sony needs a bit more vitality and insight to be more immersive. While black levels are pleasingly dark, they could be a touch deeper and more subtle in how the set defines the shadowy areas. Again, rivals are more revealing and offer more depth in dark scenes. The Sony can’t quite flesh out skin tones as naturally as others, looking a little pale in comparison. We’d put that down to its lack of absolute insight, as there’s no overriding issue with the overall balance of the Sony’s colour palette. While it’s a clean picture, we would still set the noise reduction level on ‘low’ to keep the edges of objects precise. Elsewhere in the picture-settings menus, we didn’t feel the need to turn on any extra processing modes – turning on the Black Corrector didn’t help with the less-than-perfect black levels, either. We would definitely recommend using a THX Optimizer disc to set the correct balance of backlight and brightness levels; it’s imperative that you don’t sacrifice the punchy clean whites for deeper blacks. We’ve come to expect thin sound quality coming out of the slim screens that populate the TV market, but the Sony KDL-32W654A actually delivers a decent, listenable sound that doesn’t veer towards a bright or harsh edge. It may not have the weight and smoothness of some, but the Sony’s clear dialogue and punchy effects have a solid foundation that’s easy to listen to straight from the TV. Sony’s excellent SEN (Sony Entertainment Network) service makes an appearance, with plenty of music and movies to stream from its Video Unlimited and Music Unlimited sections. A software update brings an even wider selection of services, including BBC iPlayer and Demand 5 for catch-up TV, and LoveFilm and Netflix for movies. There’s also a smattering of apps that aren’t seen on many other smart TVs (such as videos from Wired and NPR’s radio service to name a few), while YouTube is omnipresent as ever. Social networking apps are available in the form of Facebook and Twitter. Skype is also included, although you will need to buy a separate camera to make video calls. The KDL-32W654A is DLNA certified, which means you can stream media from any compatible device connected to your home network. The Sony offers both wired ethernet and wireless options, and streaming songs from our NAS device was smooth and uninterrupted. It doesn’t support any CD-ripped WAV or high-resolution FLAC files though, so you’re restricted to MP3 and WMA for music files. Connectivity is surprisingly sparse on the Sony KDL-32W654A. Take a look at the chunky back panel, and while there’s a good helping of analogue connections (composite, component and RGB scart), we were surprised so see a paltry two HDMI inputs and a single USB port. Considering cheaper sets offer as many as four HDMI inputs, it’s a poor showing from Sony, and we can imagine it’ll be frustrating for those who want to keep various devices – Blu-ray player, game console, set-top box – connected to their TV at all times. It’s also worth keeping in mind that you won’t be able to make Skype calls while recording a programme – the single USB port will be occupied by a flash drive, leaving no space for plugging in an optional camera. On the plus side, the HDMI inputs support both ARC (Audio Return Channel) and MHL (Mobile High-definition Link), so you can stream HD content directly from an Android smartphone or tablet. If you’re after ease of use, the Sony KDL-32W654A has one of the nicest and most responsive TV interfaces. Sony has swapped out the increasingly labyrinth-like structure of the Xross Media Bar interface for a neater arrangement of large tiles that displays the main settings and smart apps. While the smart apps are displayed indiscriminately on the screen, it’s quick and painless to scroll across the tiles with the supplied remote control. The controls respond instantly, with our thumb finding the main channel and volume buttons intuitively. Flicking through the Sony’s interface is smooth and swift, and there are shortcut buttons to access the main menus and SEN hub separately. While we like using the remote, Sony also offers a smarter control in the guise of the TV SideView app. Free to download for both iOS and Android devices, the TV SideView app offers an interactive control where you can browse through a detailed programme guide, select smart apps, and decide what programmes to watch and record straight from your smartphone or tablet. It’s great to use as a second screen, and the addition of cast and crew information is a bonus. However, we found the volume and channel-changing buttons on the remote screen a bit too small to use comfortably and confidently. Good for exciting smart features, then, but not very practical for more mundane operations. Sony was the belle of the ball last year, picking up Awards for nearly every TV category. It’s a different story this year, with some rivals giving just a bit more in terms of absolute excitement and insight – Sony needs to up its game to keep up with the competition. Saying that, the Sony KDL-32W654A is a worthwhile option for a second TV – the picture is still enjoyable to watch, and the wide variety of smart apps is certain to attract.